In Mechanical Engineering one must have to study about the turbine. In Hydro-Electric Power Plant mainly Impulse or Reaction Turbines are used to generate electric power from a renewable energy source. From the engineering point of view, both have some differences in working or parts. 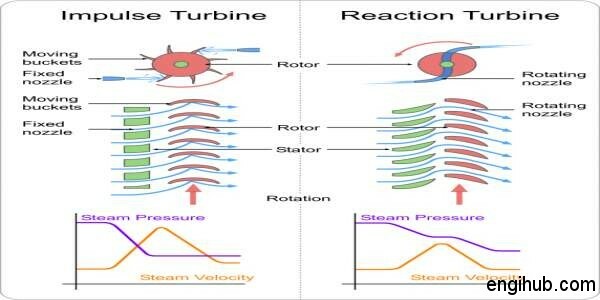 Here in this article, I am going to share the information with you about both the turbines. 1) In an impulse turbine, the water flows through the nozzles and impinges on the buckets. Whereas in reaction the water is guided by the guide blades to flow over the moving vanes. 2) In an impulse turbine, the entire water energy is first converted into kinetic energy. But there is no energy conversion in reaction turbines. 3) In an impulse, the water impinges on the buckets with kinetic energy. Whereas in reaction turbines, the water glides over the moving vanes with pressure energy. 4) In an impulse turbine, the work is done only by the change in the kinetic energy of the jet but in reaction, the work is done partly by the change in the velocity head, but almost entirely by the change in pressure head. 5) In an impulse, the pressure of flowing water remains unchanged and is equal to the atmospheric pressure. But in reaction turbines, the pressure of flowing water is reduced after gliding over the vanes. 6) In an impulse turbine, it is not essential that the wheel should run full. Moreover, there should be free access to air between the vanes and the wheel. Whereas it is essential that the wheel should always run full and kept full of water in reaction turbines. 7) In an impulse turbine, the water may be admitted to a part of the circumference or over the whole circumference of the wheel. But in reaction turbines, the water must be admitted over the whole circumference of the wheel. 8) So, It is possible to regulate the flow of water without loss in impulse turbine. But in reaction turbine, it is not possible to regulate the flow without loss. So, Here you find Best Engineering Resources for further details.